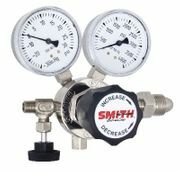 Smith® high purity analytical gas regulators are recommended for use with non-corrosive pure and mixed gas application. Typical applications include gas management of analytical instrumentation, chromatographic carrier gas and process gas regulation. These units minimize outgassing and inboard diffusion through the use of stainless steel convoluted diaphragms and high purity seats and seal rings. These regulators contain a self resetting safety relief valve vented to atmosphere to protect downstream equipment from over-pressurization and are available with optional needle valves.